"Leonardo E.M. Cioglia is a musician that demands your concentration. You can't allow yourself to be caught off guard during the first listen, for if you do, you may miss all of the little things, the silences, the influx of notes, that this guy is able to put into his music." "The songs themselves are audio illustrations of a Brazil most people aren't aware of, and Cioglia allows the characters in his songs to dance in a way that might not be possible in the real world." "These are stories that are worth returning to many times over, those who take it in as a personal favorite will find new things within the music with every listen." "Providing a fresh new approach to Brazilian music.... ....Cioglia, takes Brazilian music in a more contemporary and modern direction.... ....a terrific session of music that will transform your view of Brazilian music forever. 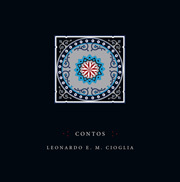 Contos delivers an interesting and unique perspective to Brazilian music which Leonardo E.M. Cioglia re-defines within the context of modern contemporary jazz." "Contos is lively, thoughtful, and full of surprises. Its composer, Leonardo E. M. Cioglia, has created some intriguing jazz motifs that will linger in your mind long after the last playing of the CD. Every performer shares his vision in a memorable blending of sound and innovation." "His music is full of magic, and his compositions are full of the mystery of life... ...one of the best bass-led groups I've heard in many years. The players meld together in almost "orchestral" fashion throughout this wonderful album." "Cioglia knows how to deliver the goods... The kind of cat that makes you feel like always making him welcome, there’s a lot going on here and all of it good." "Contos is an inimitable kind of record that engages you right away, and yet there is so much going on under the hood, in terms of both harmonics and presentation. Each succeeding listen---even the twentieth one---sounds as fresh as the first one. That's the mark of a musician who composes songs of real depth and beauty." "Bassist Leonardo Cioglia takes Brazilian Jazz in a more modern approach. ...a Brazilian 'spice' to his sound, but he explores the genre outside the box." "Leonardo Cioglia has a great feel and great timing, he is very relaxed, and I can really explore polyrhythms when I’m playing alongside someone so able." Effervescent rhythm is the currency of this quartet of musicians originally hailing from Brazil. Brazilian born bassist Leonardo Cioglia...without any doubt you could tell the many years of experience; besides virtuosi solos, he also was perfectly in command of the grooves. 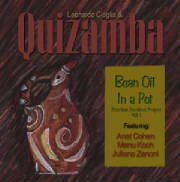 ...when Leonardo Cioglia and his group Zabumbatuq play, the club really comes alive. Of all the Brazilian bands in rotation around Boston, Zabumbatuq is the most cohesive and jazzy. Music to listen, freak out and dance. There is oxygen in Boston's nightlife. 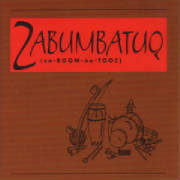 It comes wrapped in Brazilian musical notes by the quintet Zabumbatuq.